Savings are very essential to lead a happy and secured life. Despite working hard to earn money, most of us do not devote enough time on how much to save for a secure future and where to invest our savings and this chapter explains why it is so important to save. 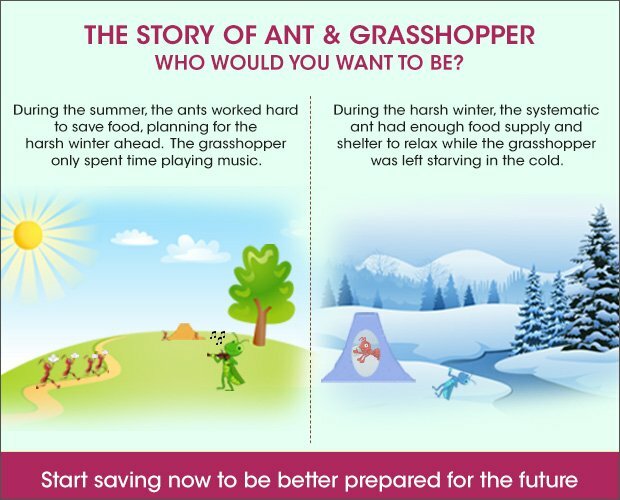 In the case of Ant and Grasshopper, as the ant had saved food for the upcoming harsh winter it was able to survive whereas the Grasshopper which did not plan ahead and wasted time had to starve and die in the cold. In the same way, Savings are essentially meant to take care of you and your family's future needs. Developments in medical science are prolonging our life span. Most of us in this generation are poised to enjoy a long retirement life. Maintaining a healthy standard of living post retirement requires a good pot of savings that are invested wisely. In earlier times, having children was the retirement solution for people. The son would take care of the parents and provide for them in their time of retirement. Many people in this generation are lucky to have their kids take care of them post retirement, as they once took care of their parents. However, one sees, hears, and reads about many unlucky parents, who are not supported by their children post retirement, and who have to severely compromise on their standard of living because of the lack of resources or savings. You need to save enough while you're earning and invest wisely in order to ensure that you can live life with dignity post retirement. While we hope that children in the coming generations will be as responsible as our generation in supporting their parents post retirement, not burdening them with our generation's retirement problems is a gift we can give them, and this is of paramount importance. At every stage of life, we have some goals to achieve. Whether it is to provide for your higher education, planning for a grand marriage, going for honeymoon to a holiday destination during 20’s-30’s, it could be for child’s education, buying a second home during 30’s-40’s and finally during 40’s-60’s you need to provide for your children’s marriage, move to a new home, plan your will and then enjoy life after retirement. There are also some goals which are not goal based but are precaution based and are needed to provide for emergencies like untimely death, accidents or any other unexpected cost that can arise out of emergencies. Apart from these we also need money for things which we would like to do such as buying a fancy gadget, going for a vacation, health and fitness related costs, pursuing new hobbies, watching movies, partying, doing charity and community work etc. These can be categorized as wants as they are not absolutely essential but are desired by everyone. Having a detailed financial plan, periodic savings as per requirement, appropriate asset allocation, investing for the long term are all ways of planning for future whether it is for the Goal based needs or for precautionary needs or for wants. Someone who is not interested in taking appropriate care of their hard earned money may not be able to meet his goals, take care of emergencies and provide for his wants. Moreover, disciplined savings bring financial independence to your life and you don’t need to depend too much on your employer or on your kids. Also saving regularly builds discipline and organizes your finances and lets you be in control of your life. Having a detailed financial plan, periodic savings as per requirement, appropriate asset allocation, investing for the long term are all ways of planning for future whether it is for the Goal based needs or for precautionary needs or for wants. Not saving enough, not saving regularly, keeping our money idle, speculating on penny stocks, buying stocks on tips, not having a proper investment plan, etc. are examples of careless practices that can put you at a great risk in future of not meeting your goals, emergencies and wants and may force you to take debt and have the potential to change your lifestyle completely. Most of us work very hard to earn money. We spend long hours at work just to earn that extra bonus. Many a times our long hours at office, coupled with irregular eating habits, and work related stress may result in life threatening diseases like heart attack, high blood pressure and diabetes. This leads to a stoppage in the income flow, and brings up the need for savings to continue living the same way. However, many of us do not work hard enough to take care of our money when we have a good flow of income. If you save enough of your income regularly and invest it wisely, it can help reduce your stress of generating the extra income when you need it unexpectedly. You are not going to earn all your life and the period of working life is limited, so you must save regularly and invest to provide enough for your retirement or non-working life. Saving and investing is important so as to take care during emergencies and achieve your goals in life.